A tale of spine-tingling horror, psychological fright, the undead, and the bitter cold of a supernatural winter come together in this account of unexpected twists and mounting dread. Dan Kerr turned his back on his wife and unborn daughter 10 years ago. Now, both mother and child have gone missing, and Dan must embark on a weird tale of cosmic terror in order to find them again! 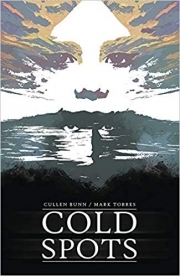 Ghosts stir when Dan's estranged daughter is near, and as the dead grow restless, the cold deepens.